This year I was lucky enough to go on a cruise through the Caribbean, from Miami in the United States of America, to Jamaica, the Cayman Islands, Mexico, and the Bahamas. Blurb about the beer: Sands is a full-bodied beer with a smooth, soft, pleasant texture and a presentation of classic gold colour. 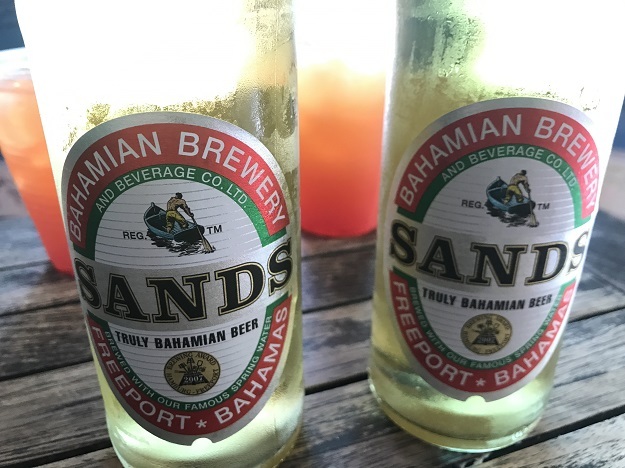 According to the Bahamian Brewery Beverage & Co. website, it was launched in Grand Bahama only in 2007, before becoming a national Bahamian brand the following year. Tastes like: The first one didn’t even touch the sides. Did I mention how bloody hot it gets in the Bahamas in July? Well, I managed to slow myself down on the second beer, and all I can taste is sweet grain, a little bit of malt, and almost a complete absence of hops. Sands is thin and watery, very bubbly, and looks straw-coloured through the clear glass bottle. The verdict: I think I liked Sands beer better when it didn’t touch the sides. But I’m in the beautiful Bahamas, so who cares?